PTC headquarters building in Harrisburg, Pennslvyania, as seen from the westbound lanes near Exit 247. A former leader of the Pennsylvania State Senate and seven other people have been charged with crimes related to vendor contracts and other key relationship contracts with the Pennsylvania Turnpike. The eight are charged with a variety of crimes, including conspiracy, commercial bribery, bid rigging, theft and conflict of interest. 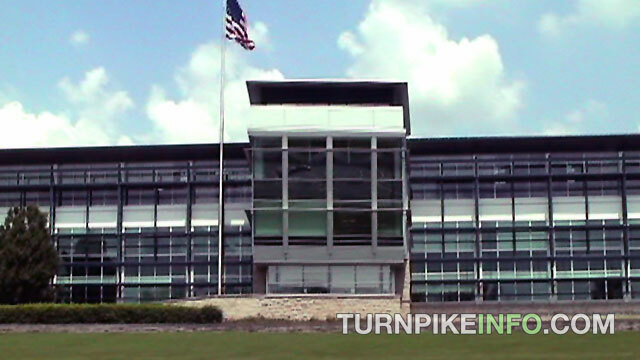 The charges and investigation were unveiled March 13 in Harrisburg, the home of the Pennsylvania Turnpike Authority’s main offices, which can be seen from the turnpike, itself. One of the people charged in the long-running investigation and criminal case is from Florida, although there was no indication any of the criminal activity was related to Florida’s Turnpike. The defendants include former Pennsylvania Senate Democratic Leader Bob Mellow, the former chairman of the Pennsylvania Turnpike, Mitchell Rubin, and the former chief executive of the Penna Turnpike, Joe Brimmeier. Raymond Zajicek of Tarpon Springs, Florida, was the the only person charged who was not from Pennsylvania. The remaining defendants include two turnpike vendors, Dennis Miller and Jeffrey Suzenski, and two other former turnpike officials: George Hatalowich, Melvin Shelton. Mr. Zajicek, of Florida, was also once a turnpike official in Pennsylvania. Indeed, the way the turnpike chose vendors may have been directed by the former Senate Democratic Leader. Kane said a grand jury found “substantial evidence” Mr. Mellow had directed at least one aide to help political contributors get contracts for work on the turnpike. The Pennsylvania Turnpike Commission released a statement calling the charges indefensible. “If charges against former [Pennsylvania] Turnpike employees are proven,” the statement reads, “we certainly cannot … defend that. “Without a doubt, the commission remains committed to continuing our efforts to improve the accountability and operations of the Pennsylvania Turnpike,” the statement continues. Drivers in Pennsylvania who commented on the news story, at least on the Internet, were quite mixed. One man said he would protest “as a statement against corruption” by staying off the turnpike. Others offered positive feedback about the diligence of the attorney general’s office in helping expose the alleged criminal activity. Editor's note: This story has been modified from its original version, which misidentified the Pennsylvania Turnpike Commission as the Pennsylvania Turnpike Authority. Next Next post: Three Weeks Is A Charmer! Gas Prices Fall Again, But Is That About To Change?